Suitable for a wide range of tasks, our Gompels White Napkins have been developed for use in all manner of environments. 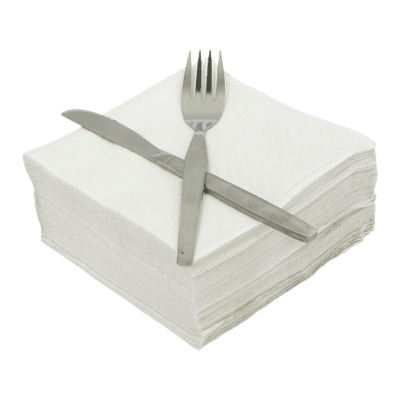 Manufactured from a good quality 1 ply paper, these white square napkins can be placed alongside plates or on to your existing table dressing to offer cleaning solutions during meals. Effective for wiping faces and spills, this large set of 5,000 napkins is an economic and intelligent choice for larger catering environments or special events. Our white napkins are packed into smaller groups of 500, allowing you to easily store the remaining stock away until needed. Our durable napkins are also available in a patterned red for special events. Consider investing in our Jugs with Blue Lids, Gingham Placemats or our Banquet Roll for your next important event.